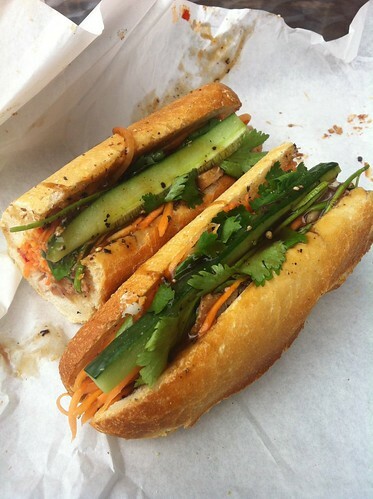 LOCATION: Monty’s Deli, Maltby Street Market, Bermondsey [map]. FILLING: Pastrami, Swiss cheese, Russian dressing, yellow mustard, sauerkraut. PROS: As my sandwich is built I stand, semi-catatonic, mesmerised; pastrami is sliced from wobbly hunks and piled into an ever-growing tower of protein. The Shard, overlooking the market, begins to look small in comparison. I’m offered a piece of the meat to taste as I wait, and….oh – it’s a little dry and chewy. Once pressed in the toaster however, which struggles to clamp its jaws around the beast, the fat melts and everything softens. Some pockets of fat remain intact (though I wish for more), begging to dissolve on the tongue and settle on the hips. The crust of predominantly black pepper and coriander seeds is really pokey; a revelation compared to the crap we usually get served in the UK. Russian dressing and sauerkraut are carefully applied in just the right amounts, too; their flavour and moisture is welcome and yet they do nothing more than big up the meat. CONS: The pastrami could learn a few tricks from the salt beef, which is gloriously moist and fatty. As I wait for my reuben to toast I am distracted by the request of another customer, ‘one special, please’. One WHAT, sorry? What is this special of which you speak and why am I not having it? I am drawn to a frankly miniscule sign on the counter top. 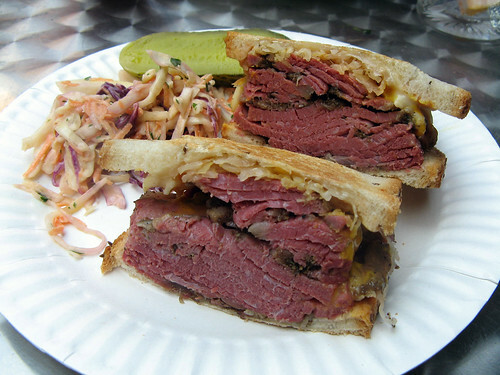 Turns out I could have been eating this reuben with an extra topping of salt beef. I try a piece. It is INCREDIBLE. 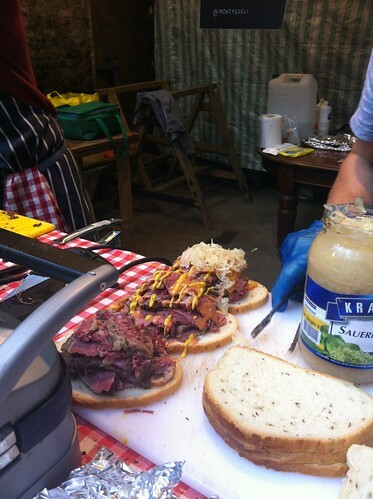 This is lauded as the best salt beef in London by a man who really knows his salt beef. So, when I think about this sandwich compared to other reubens available in London it could easily have scored 9/10, but I’m knocking a point off for their failure to properly advertise their special. PRICE: £9.50 for a burger with chips. PROS: People, especially food people, specifically London food people, have very fixed ideas about what does and does not make a good burger. It must have slappy processed cheese, it must have a light brioche bun etc etc bore bore bore off snooze snore sleepy time. I am of the opinion that there is room in the world for many different styles of burger and yet I was a little worried about trying this one. Comte? Really? Dill butter? Really? Am I allowed to like this? Really? 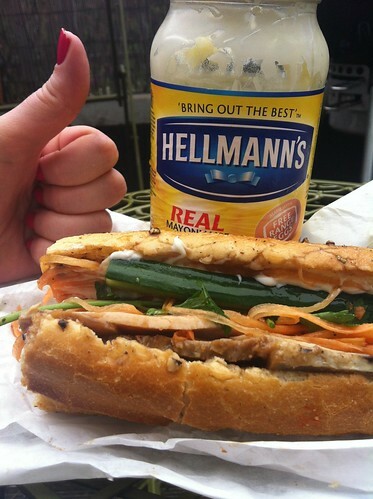 CONS: The pickles were a touch too salty. I don’t get the point of the linseeds on the bun. 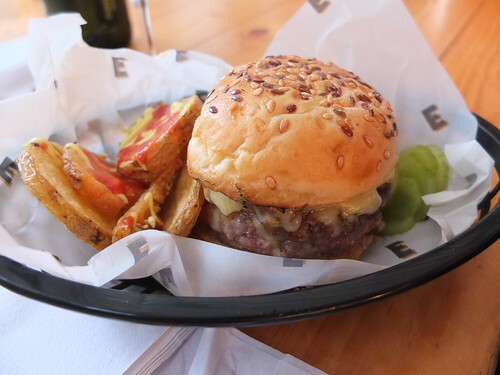 So I ate this burger at the RAW and Elliot’s pop up which is running until 12th August but the burger is available at Elliot’s permanent site just across the road. The pop up however is awesome. Go, drink some natural wine with your burger. Pop in for a glass and then leave at 11pm having sunk a further 3 bottles like I did. Ahem.